The Hayes Players was established in 1933 by Josiah Merrill, and has regularly been presenting plays in the Hayes Village Hall (see map) since the first performance in March 1934. Our productions, four or five a year, range between comedies, farces, serious plays and melodrama, interposed with an occasional musical play, revue or pantomime. Over the last four seasons, the audience over the three nights of each production averaged 500. 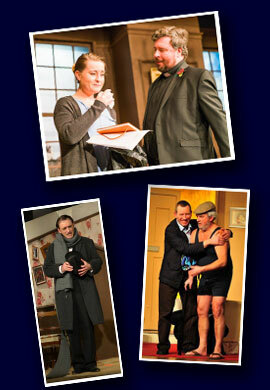 Due to increased demand we are now running productions over four nights. We are proud of the quality of all aspects of our productions such as acting, direction, presentation and great team work. We have a long history of success in local drama competitions, including awards in both the Kent and Bromley Drama Festivals. We support local community activities in partnership with other local societies, and have provided equipment and facilities for the Hayes Village Hall. We have our own busy social calendar, and regular newsletters keep members informed of what is going on. We rehearse and construct scenery in the Merrill Studio, off George Lane (see map), in which we also store our scenery, furniture, properties and costumes. For tickets call our Box Office on 07905 210718 or email boxoffice@hayesplayers.co.uk. For further information about the society including membership please contact our Secretary David McDonnell-Pascoe by email info@hayesplayers.co.uk, by phone on 07505 625769 or post to 60 Grasmere Gardens, Orpington, Kent BR6 8HF.